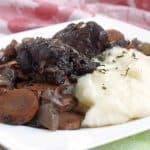 Braising is the perfect technique for cooking venison roast, and this Beer Braised Venison Roast recipe brings a German flair and intense flavor that are destine to be a family favorite. We often run into people who aren’t a fan of deer meat. And, while everyone is entitled to their own preferences, we often find that these people have had an unfortunate run-in with some poorly cooked venison. This one experience often sits firmly in their mind as something that needs not be repeated. The thing is, venison is a different kind of meat that needs a little extra care in the kitchen. Venison is lean. Deer don’t have the marbling that cattle do, so cooking it like beef isn’t going to work too well. The cooking method for venison really depends on the cut you are using. 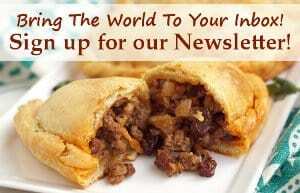 Tenderloins and loins – Quickly sear or grill to 130F and let rest 10 minutes before serving. 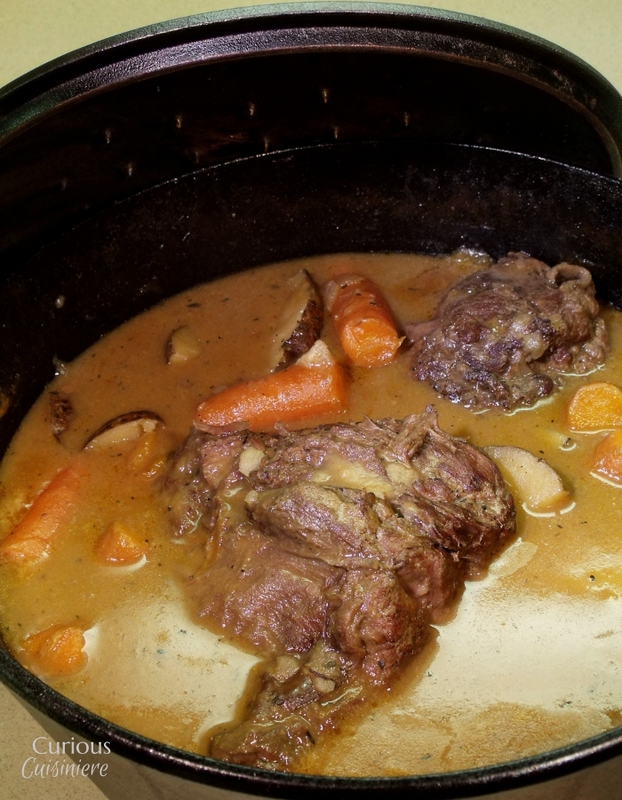 Shoulders and roasts – Braise low and slow (around 130F) for several hours. In addition to choosing the right cooking method, it’s a good idea to add ingredients to your rub or marinade that will tenderize your venison. Salt in rubs helps to break down proteins and improve the texture of the venison. In this beer braised venison roast recipe we’re combining low and slow braising with the acidity of beer to achieve some stellar results. We slow simmer this venison roast recipe for 3 hours, and the result is tender, fall-apart meat. The beer and other seasonings infuse the meat with the caramely flavors, a slight tartness from the mustard, and just the perfect hint of sweet from the tomato paste and brown sugar. 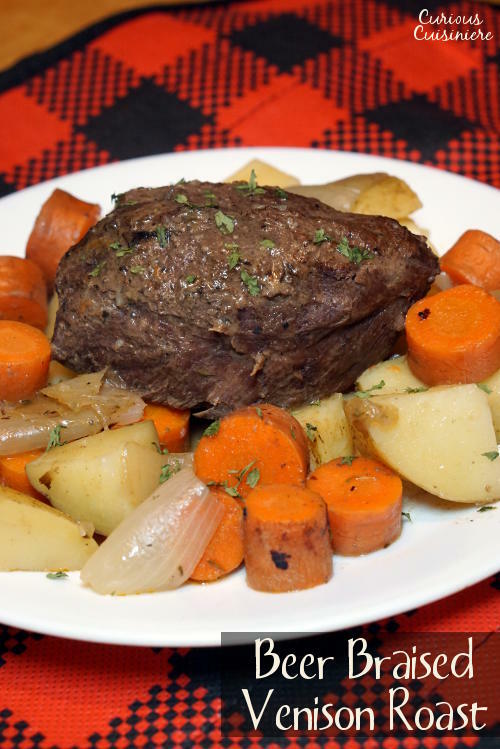 We love the way that the mustard and beer in this recipe give the finished venison roast a distinctly German aroma and flavor. 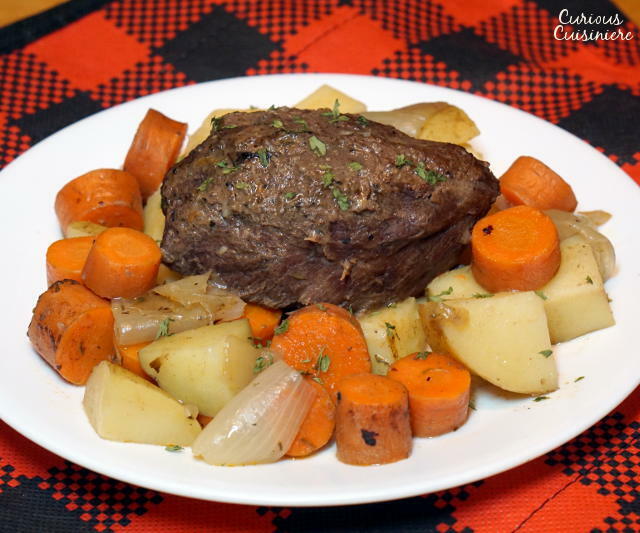 It would be a perfect, hearty recipe to serve along side of your favorite Oktoberfest beer! This is the perfect, hearty meal for spending hours at the table, catching up with family and enjoying the company. And, did I mention, it makes the house smell AMAZING! If you don’t have access to venison, don’t worry. 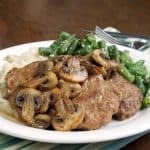 This dish is just as tasty if you use a beef chuck roast! Season roast with salt and pepper. In a 2 gallon or larger Dutch oven or soup pot melt 1 Tbsp butter. Add the roast and sear on all sides over medium-high heat, 1-2 minutes per side. Remove the roast from pot. Reduce heat to medium and add the remaining 2 Tbsp butter. Melt butter and add onions. Saute until golden brown, 3-5 minutes. Add potatoes and carrots, saute 1-2 minutes. Add flour and stir until moistened. Stir in beer, stock, tomato paste, brown sugar, mustard powder, and thyme. Mix well. Add the roast back to pot, nestling it among the vegetables. Bring the mixture to a simmer. Reduce the heat to maintain a simmer and cover the pot. Simmer for 3 hours. Thirty minutes before serving, remove the lid from the pot. 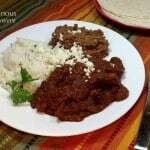 If the stew looks too brothy, place ¼ c of flour in a small bowl. Ladle ½ – ¾ c of broth from the pot into the flour and whisk until no lumps remain. Pour mixture into the stew and stir to incorporate. Continue to simmer, uncovered, until sauce thickens slightly. This recipe from 2013 was updated in December 2015. We made the roast even better. Enjoy! Our neighbor gave us a 2lb venison roast. I’m not familiar with cooking venison but this recipe looks like agood place to start. Would you suggest I reduce the cooking time and halve the other ingredients? What a nice neighbor! You can definitely reduce the cooking time, probably to closer to 2 hours. Although, as long as the roast is covered in liquid, cooking it for the full 3 hours will just increase the tenderness and won’t dry it out. You can halve the other ingredients if you like. Often, we don’t when we cook a smaller roast, because we like having them as leftovers. Enjoy! Delish! I used one while potato, one sweet potato, one-half of a rutabaga, two stalks of celery and some carrots with a venison roast. Loved it! What delicious additions! Glad you enjoyed it! My first ever recipe review (and trust me I try a lot of recipes online)!! The entire family LOVED this recipe. It made the venison so much better than how you’d cook the typical beef roast. I was worried it would just taste like beer but it didn’t and was so good. I didn’t have broth so I used two chicken bullion cubes with two cups of water as a substitute. I did add more salt and garlic powder at the end to my liking to finish the gravy. Will always use this recipe from now on. So glad you and your family loved the venison recipe Tiffany! Hi Colleen, We are not familiar with instapot cooking, but my best guess would be to do it the same way you would do a 4 lb beef roast. If you give it a try, let us know how it turns out for you! We made this recipe for New Year’s Eve dinner and it was FABULOUS! We only slightly modified it by using sprigs of thyme and rosemary, and omitted the potatoes as we chose baked potato with sour cream on the side. We could have easily made gravy at the end however the juice was so tasty, we didn’t want to change it! Best venison we ever had! Thank you! We’re so glad you enjoyed this venison recipe Carol! What can I substitute for the mustard because my boyfriend is allergic to onions and mustard? Hi Michelle, You would be fine omitting the mustard from this recipe. If you wanted to add another element in, you could try a little grated horseradish root or a Tbsp of apple cider vinegar. There really is no right or wrong beer to use. Changing the style of beer will just change the feel of the dish. A darker beer will give a more deep flavor. A lager will give a lighter flavor. So you can really play with this recipe! We often use an Oktoberfest or amber as our go to! Thanks for this recipe! Making it today for the 5th or 6th time. Make all my venison roasts this way. The stouter the beer the better. So glad you enjoy the recipe John! Isn’t it so fun to try with different beers and see how the flavors change? 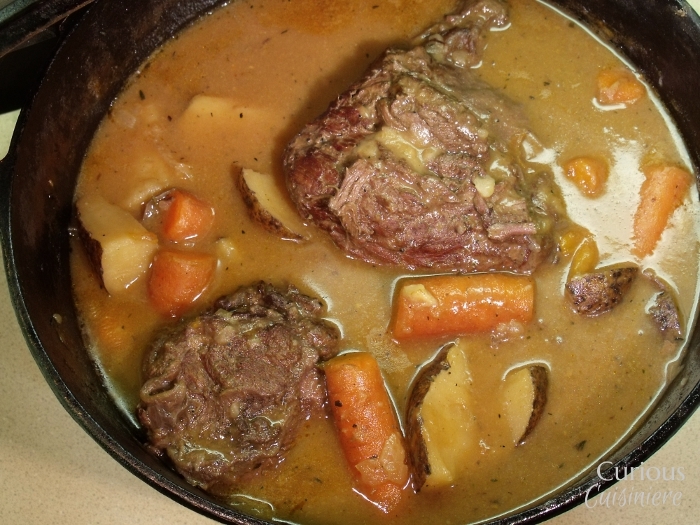 I love this recipe…I have also used it on other cuts of venison and I use my slow cooker. Great idea to use your slow cooker! We’re so glad you enjoy the recipe! How long do you put it in the slow cooker for? I’ve seen other recipes say to put on Low for 6 hours. is that about right? Made it tonight. BAM! Simply INCREDIBLE!! 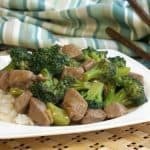 Would love to try this with stew meat! Suggestions on modifying the recipe?? Hi Lise! 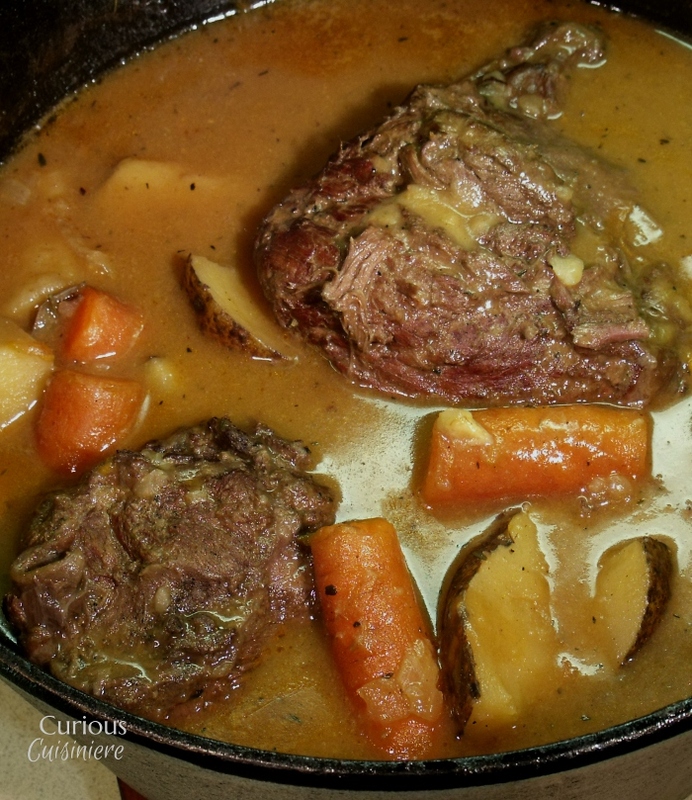 Stew meat would work well in this recipe as a substitute for the venison roast. If you are using cubed meat, cooking the meat for the full 3 hours will make them incredibly, fall-apart tender. If you want them to hold their shape a little more, you might want to use a whole roast (or reduce the cooking time to 2 hours). Enjoy! Or you could flour and brown the cubes to help them hold shape. This is a great recipe. Very easy to follow. Great results. I substituted fresh thyme sprigs and added some whole mustard seed. Now what am I going to do with the rest of the venison? So glad you enjoyed it Kevin! Your additions sound tasty! As for the rest of your venison, you can find more of our venison recipes here https://www.curiouscuisiniere.com/tag/venison/ 🙂 Enjoy! My boyfriend is the one who knows his way around deer meat, as I didnt grow up eating very much venison. This recipe is sure to be a big hit when he gets up for work tonight! It smells amazing, I can hardly wait! 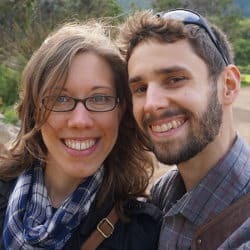 We hope you both enjoy it! What modifications would you make if using an Instant Pot? Hi Tanya. Unfortunately, we are not familiar with Instant Pot cooking, so we’re not comfortable giving recommendations for converting the recipe. Does your pot’s instruction booklet have guidelines for converting recipes? I would reduce the cooking time to 25-30 minutes of pressure. 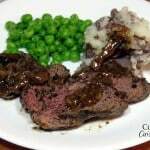 I was pretty nervous as I’ve never made a roast from deer before but this had delicious flavor and the meat was so tender – my whole family loved it, even my 3 and 7 year old. Thank you! Wonderful! So glad you enjoyed it! Hopefully it gave you confidence to continue cooking with venison! This is a fantastic recipe! Makes venison roast a delicacy! Thank you Louise! It is definitely one of our favorite ways to cook venison! Would like to make this for Christmas eve. Can this be made the day before? To make this ahead of time, you could go two ways. If you just want to prep it ahead of time, you would prepare it through “Step 3” where you add the roast back to the pot of sauted vegetables and sauce. Then, you can let the mixture cool in your Dutch oven or soup pot and refrigerate it right in the pot over night. Then day-of, you can bring the mixture up to a simmer and continue with step 4. Alternately, you could very easily prepare the entire recipe the ahead of time. I would still let it cool and refrigerate it in your cooking pot, so that day of you can bring it to a simmer for 15-30 minutes to make sure it’s heated through. We hope you enjoy it! Merry Christmas! Instead of a dutch oven, do you think it would come out OK using a crock pot? Great question! To cook this in the crock pot, we would prepare the ingredients through step 2. Then mix everything in the crock pot. Cook on high 4-5 hours or low 6-7. If you give it a try, let us know how it turns out! I have made this multiple times and my family has loved it. However instead of a Roast I used Venison stew meat. This makes an amazing Stew. Thank You for the recipe. Thanks Michelle! 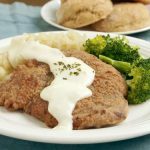 We are so excited that you and your family love this recipe! 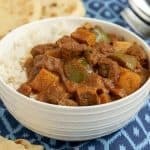 Venison stew meat sounds like a wonderful choice! Made this last night!! Awesome recipe!! So glad you loved the recipe, Niki! Thanks for stopping by to tell us how it turned out!